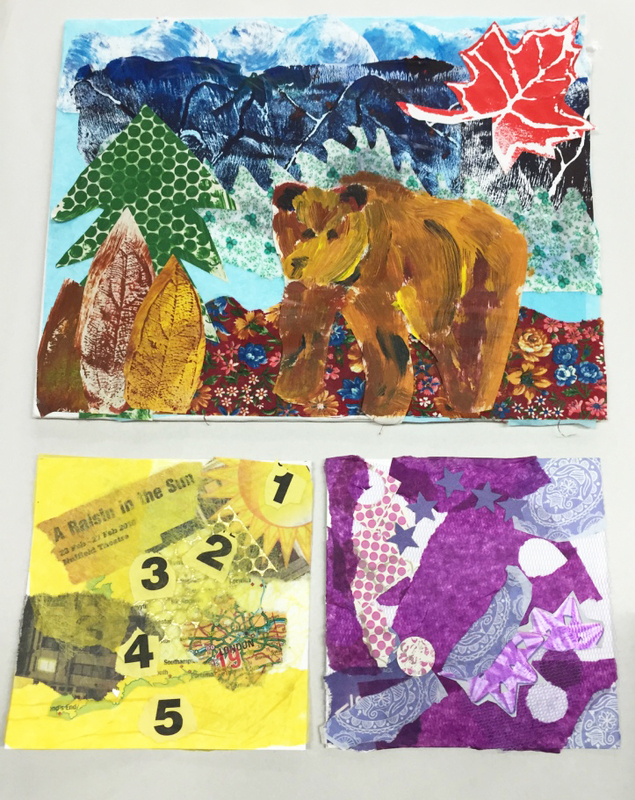 Rachel has many years of experience providing high quality art and textile printing workshops for adults and children. This gallery displays a selection of these. 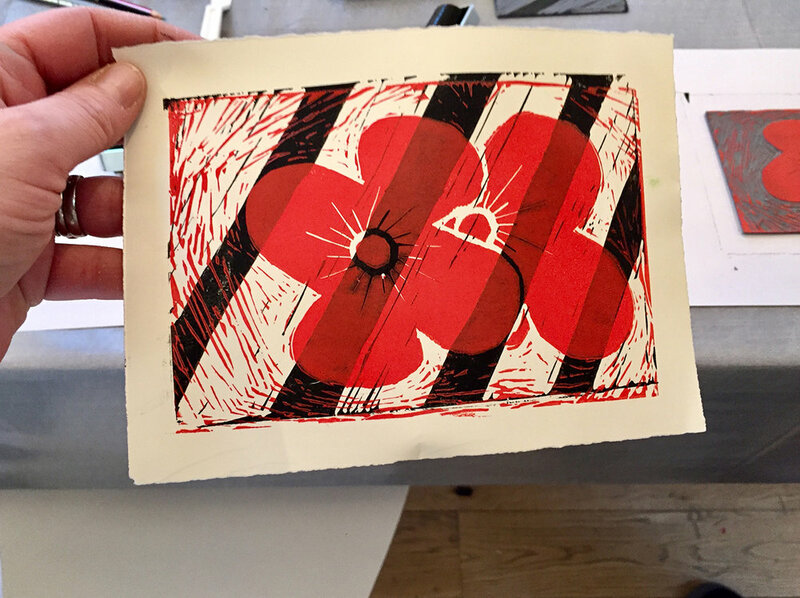 Despite the weather, we were tucked up in the inspiring, beautiful Loam Studios for a day of relief printing, using Lino to create two colour prints. 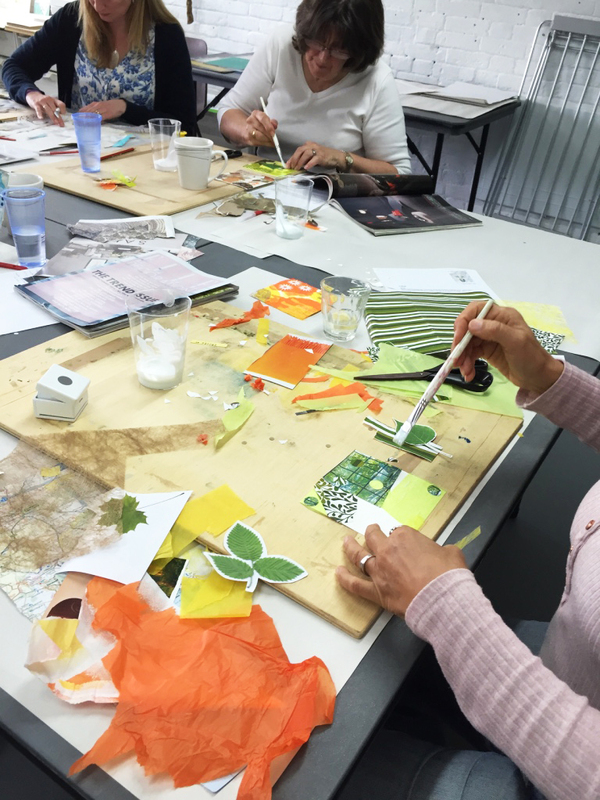 There was such a talented bunch of participants some of whom had never been on a creative workshop before! 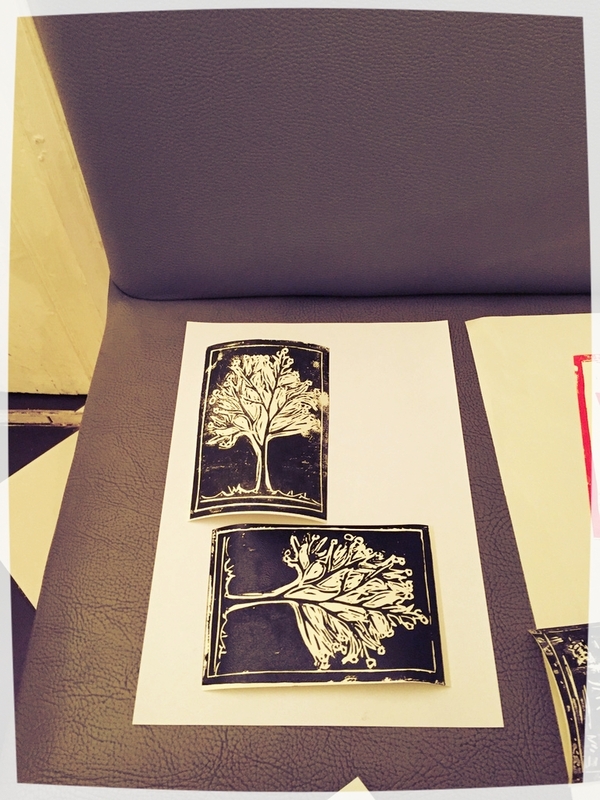 The morning was filled with the planning and preparation of a design, followed by the cutting of two Lino blocks. This is always the most challenging part with thought for the reverse image, the positive and negative spaces for cutting and how much detail to add or leave! A well deserved delicious lunch followed from our studio host Jack. 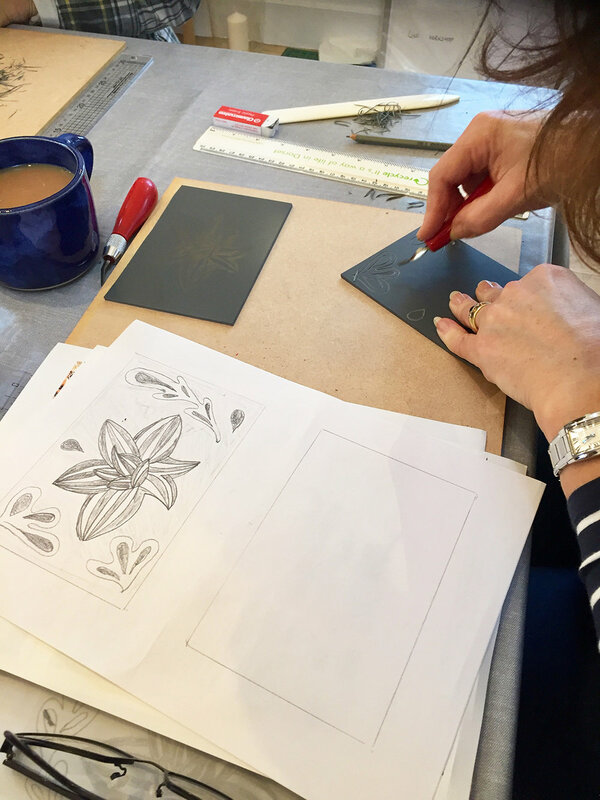 The final part of the afternoon was the printing stage, with the studio space rapidly filling with an array of colourful prints showing striking abstract and delicate florals, geometric patterns and motives. 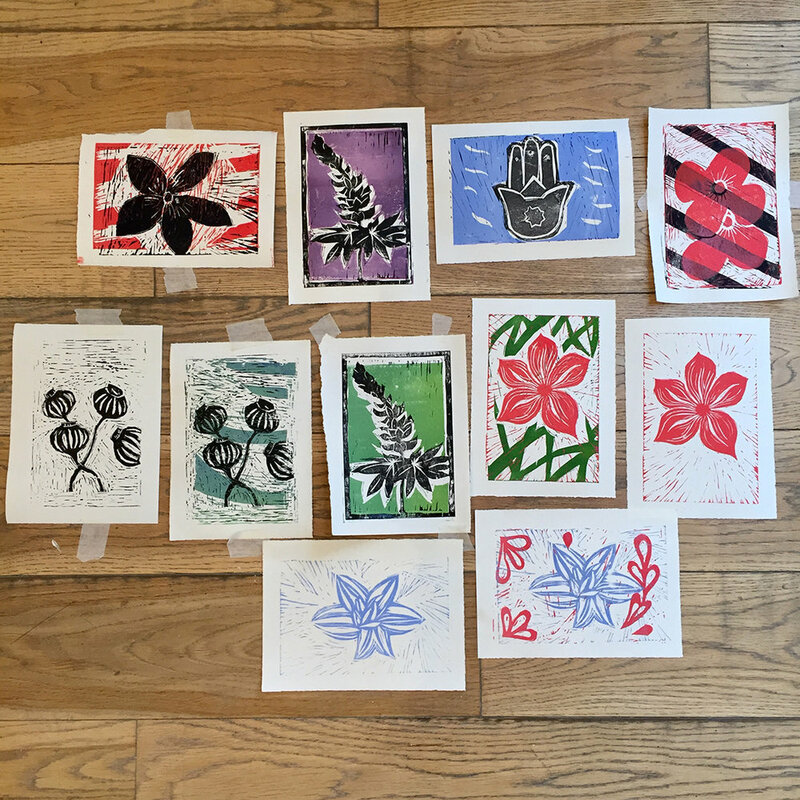 I love seeing the results of our participants prints after their hard morning of cutting….sometimes there’s a little bit more to cut and print again, but overall such inspiring results. Always inspires me to get on with my own! Here are images of some their results. Colourful Collage at Rum's Eg! 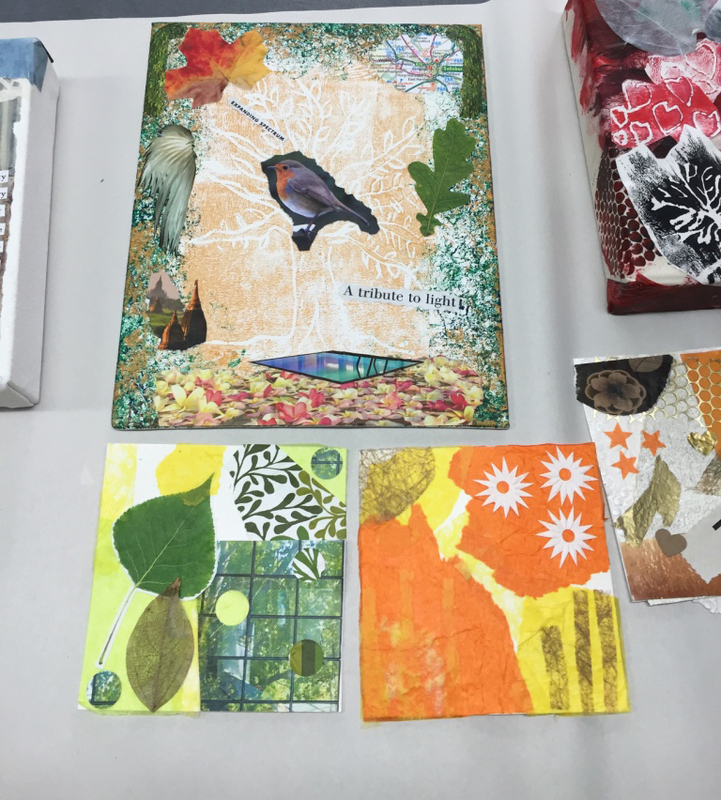 A busy day with a full class experimenting with creating paper collages. 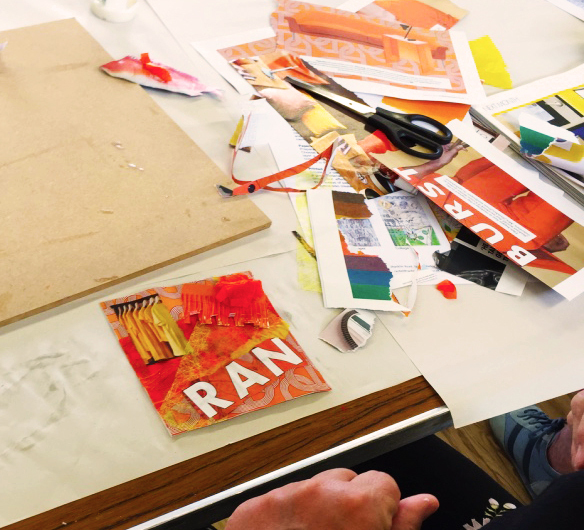 Starting with colour and composition exercises, through to printing, painting, tearing and assembling found and collected materials alongside participants own paper prints and drawings, to create a unique finished block canvas collage. 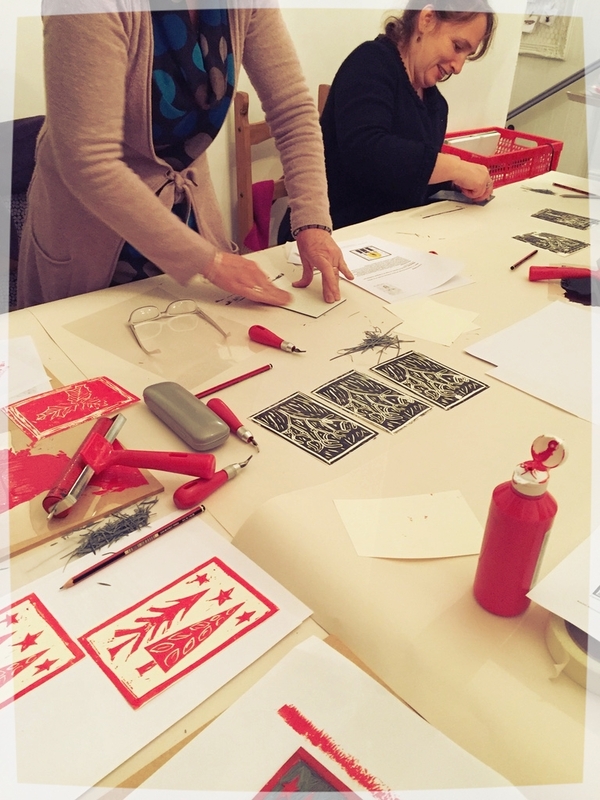 Our postponed Christmas lino printing workshop went ahead yesterday with Art Care, Salisbury NHS Foundation Trust. 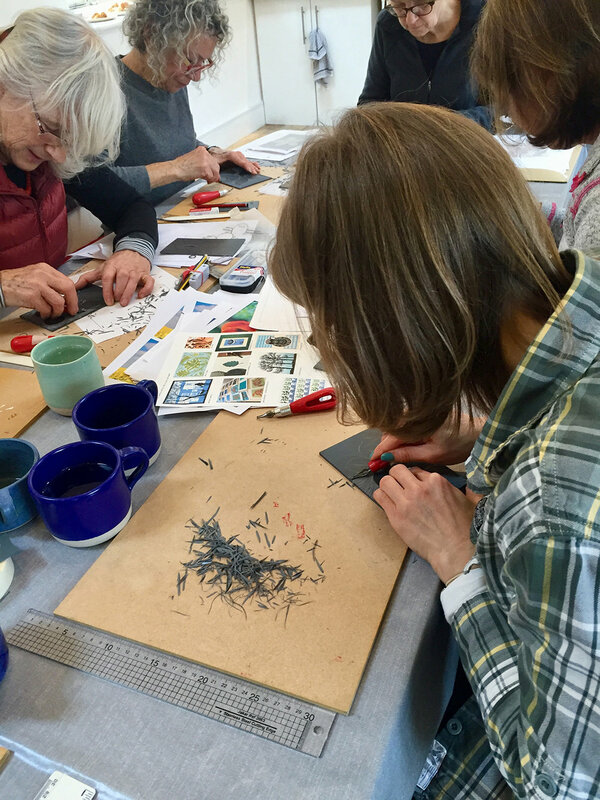 Participants drew their images and designs onto Lino and then cut away using specialist tools. Single colour prints were printed using water based printing inks onto various papers and card. Time was taken learning and practising the cutting technique, with a few trickier designs for some! Patience pursued and the finished printed results were worth their time & effort! Again, great results from a 2hr taster session. 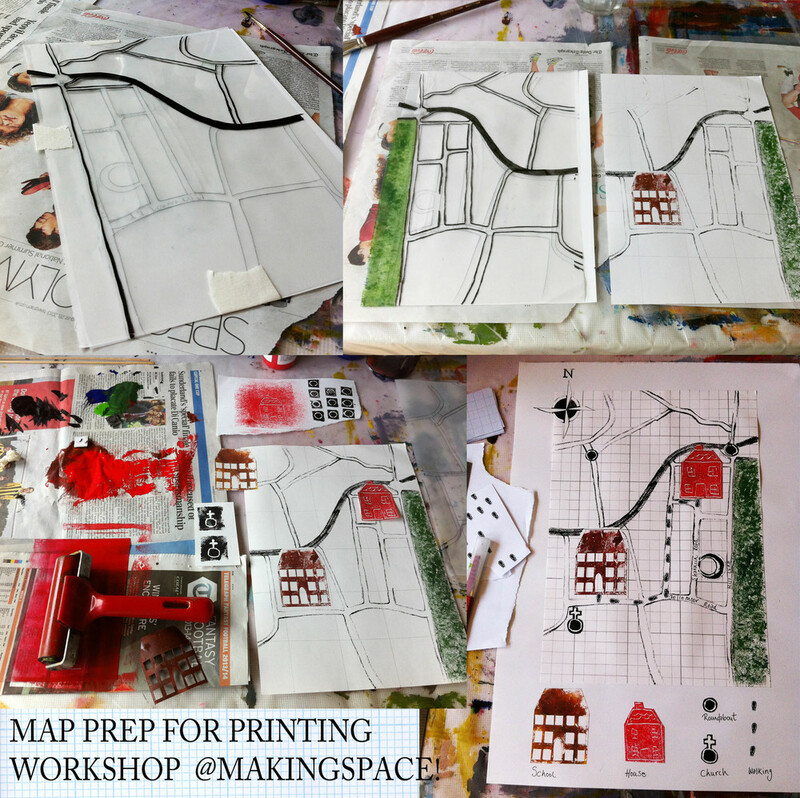 An evening workshop of Lino cutting and printing. 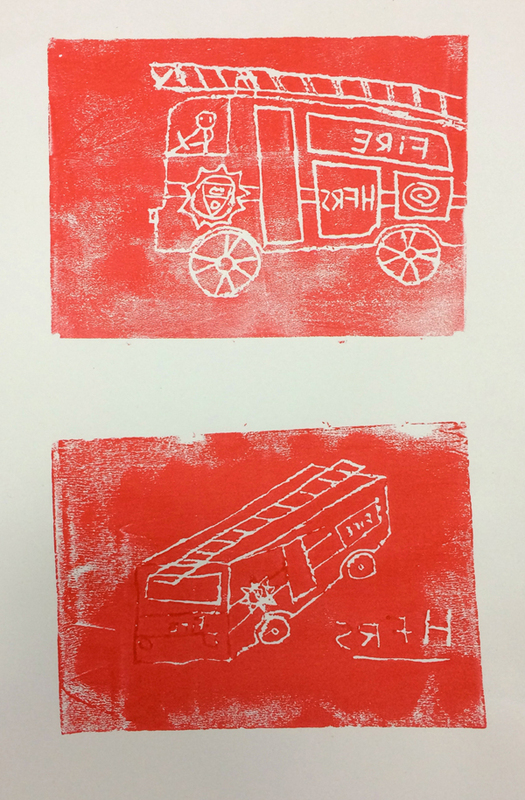 A range of Christmassy images were drawn onto Lino blocks and cut out using specialist tools. A fabulous array of prints were then printed onto paper and card ready for Christmas! Some very impressive results from a 2 hr workshop! 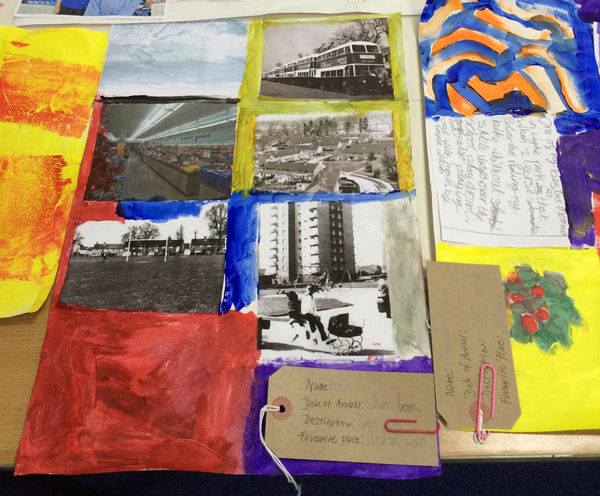 A lovely group of staff took some time out to create, print, cut, paint and assemble collected images, materials and papers into a collage artwork. This was a 2 hr taster session and some great results were achieved, as you can see in the images below. Some lovely results from the Collage workshop held today @rum'seg we started with colour exercises, followed by printing techniques and a final collage piece. Pattern, print and texture will be explored and developed using a variety of printing techniques. 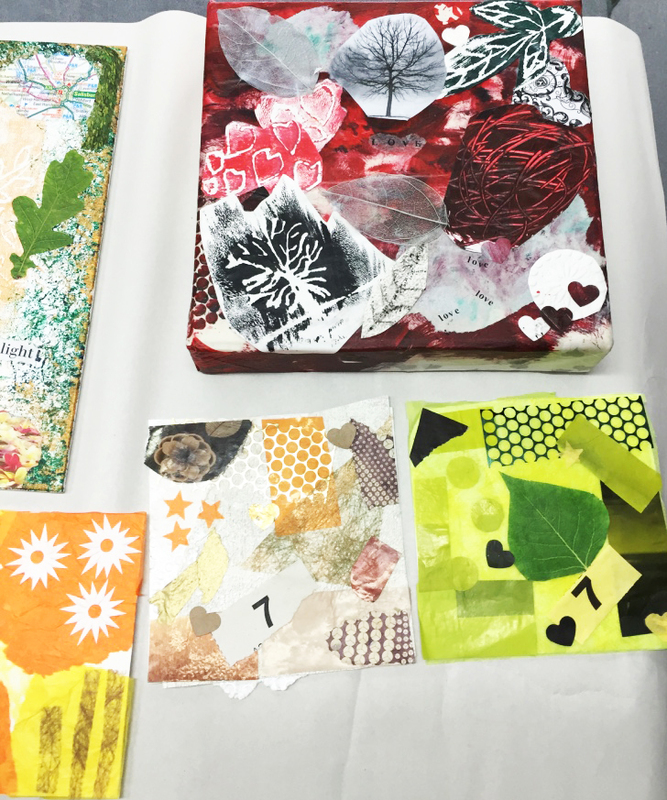 A collection of fabric and paper samples will be produced using lino printing, transfer printing, stencil and screen-printing. This course is aimed at beginners and intermediates, 25th June, 2, 9, 16, 23 July 2013. Contact www.makingspace.org for further details. Previous workshop, printing and painting experiments. 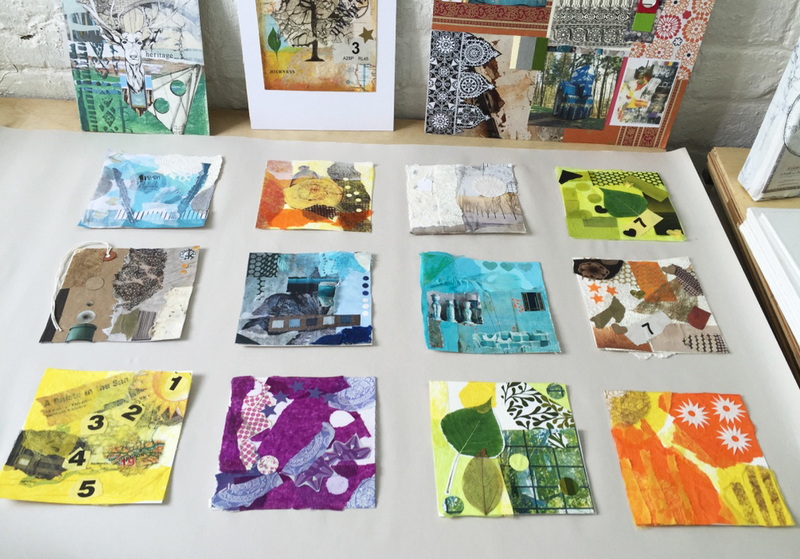 A collection of mood boards, hand painted & printed fabric backgrounds, collograph blocks & prints & Lino prints. Pattern, print and texture will be explored and developed using a variety of printing techniques. 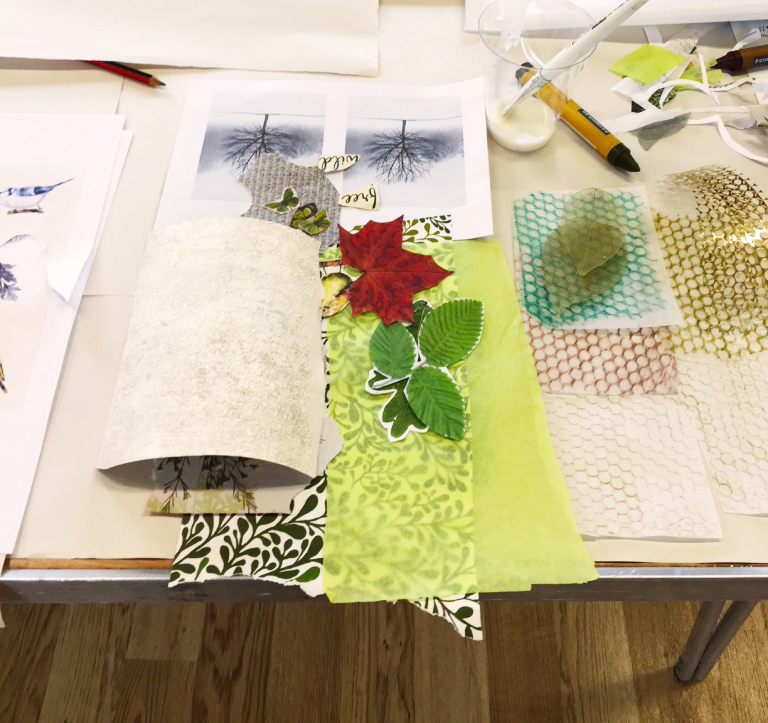 A collection of fabric and paper samples will be produced using lino printing, transfer printing, stencil and screen-printing. This course is aimed at beginners and intermediates. Tuesdays 14, 21 May, 4, 11, 18 June. 10.30am-12.30pm | £95 including all materials. 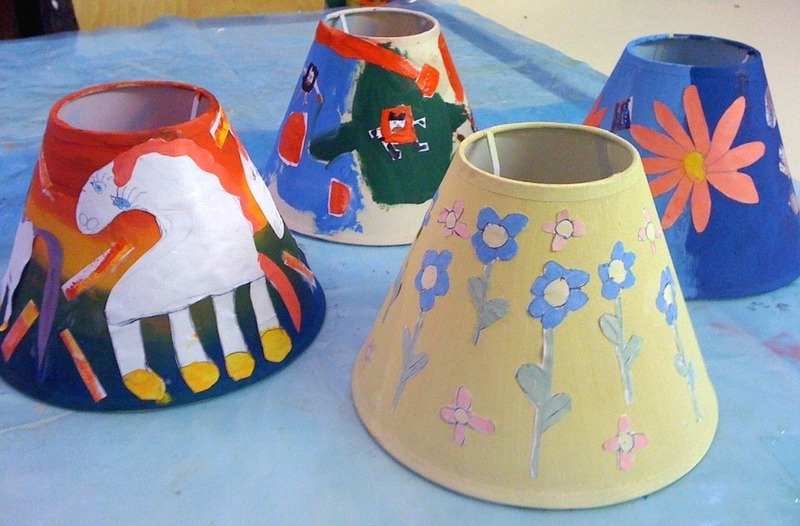 Have fun creating a funky hand painted light shade. 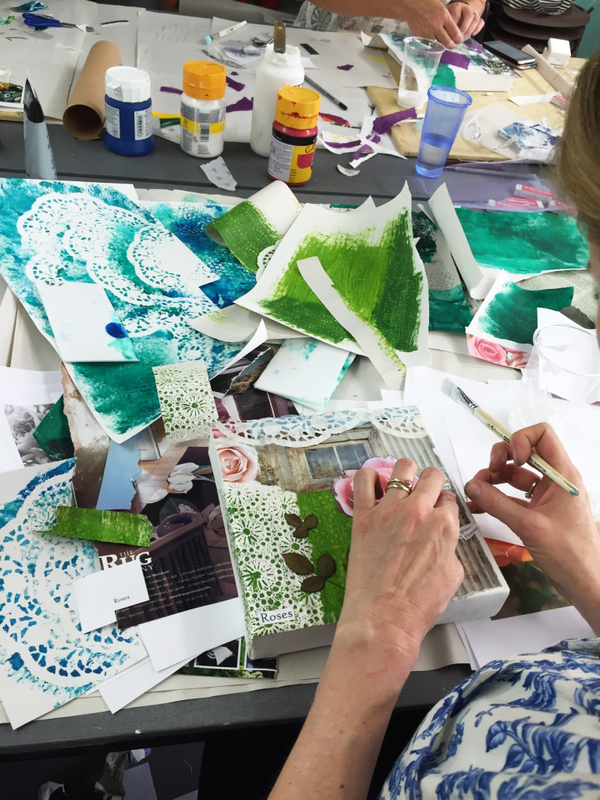 Techniques used will include, sponging, mark making, collage and painting. 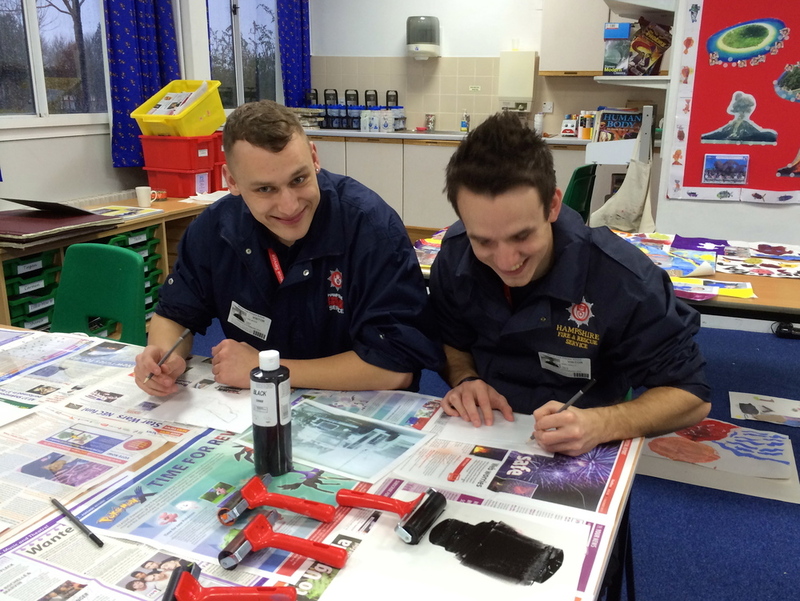 The aim of the class will be for each child to learn new techniques, stretch their imagination and have fun creating their own finished product to take home. 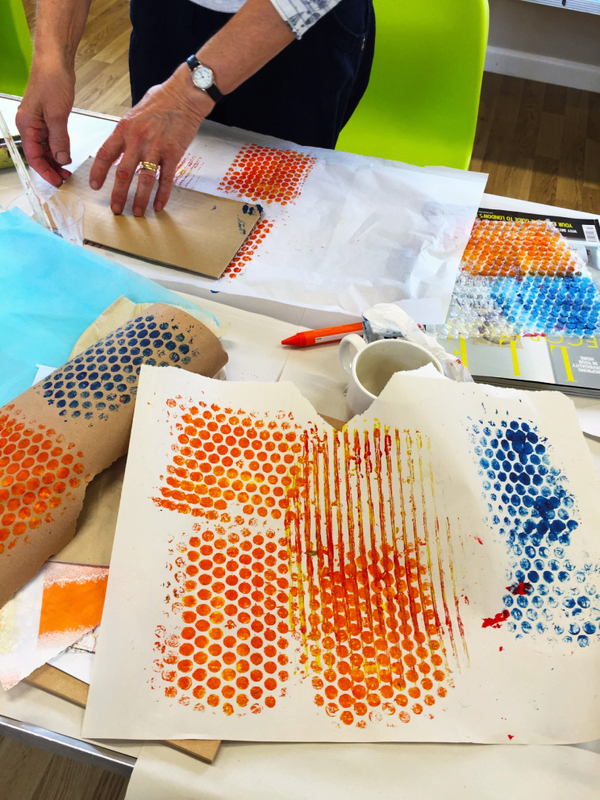 Create colourful and exciting fabric prints. 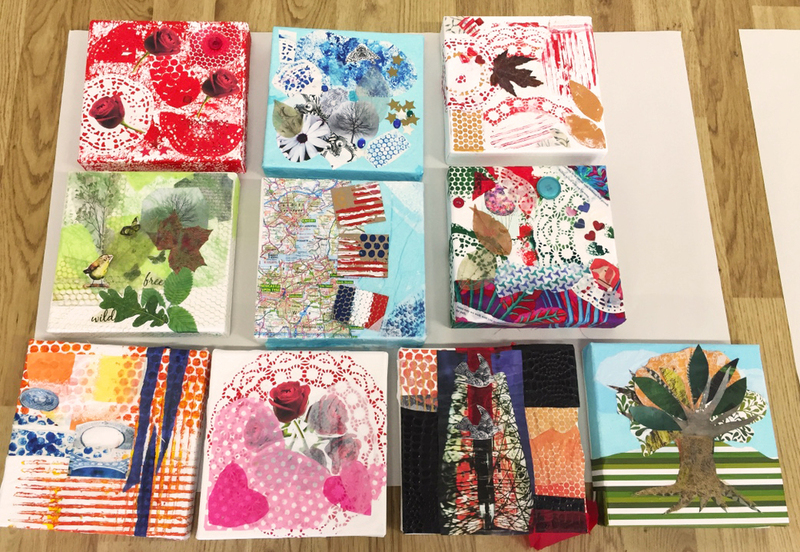 Use silkscreens, stencils and fabric paints to explore a range of hand painting and screen printing techniques to produce a variety of inspiring fabric samples.